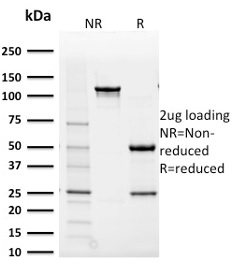 Western Blot Analysis A) Recombinant Protein (B) Raji cell lysate Using PAX8 Mouse Monoclonal Antibody (PAX8/1491). 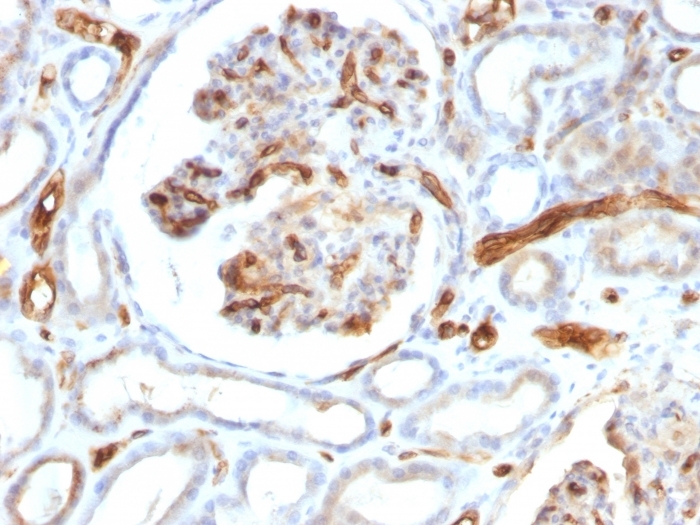 Formalin-fixed, paraffin-embedded human Renal Cell Carcinoma stained with PAX8 Mouse Monoclonal Antibody (PAX8/1491). 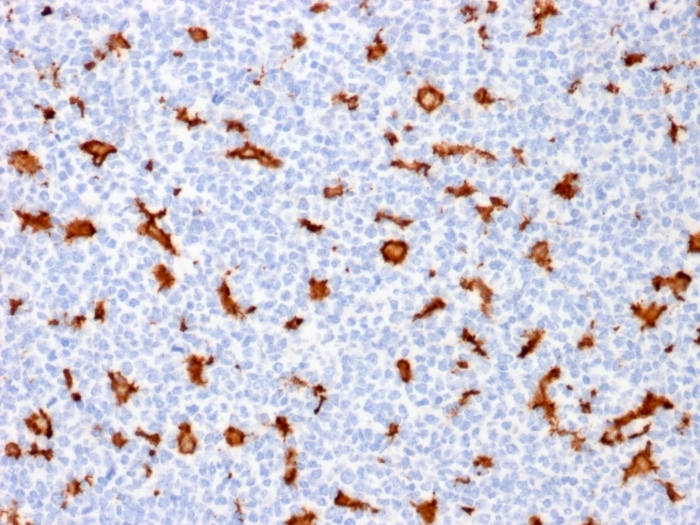 Formalin-fixed, paraffin-embedded human Thyroidal Carcinoma stained with PAX8 Mouse Monoclonal Antibody (PAX8/1491). 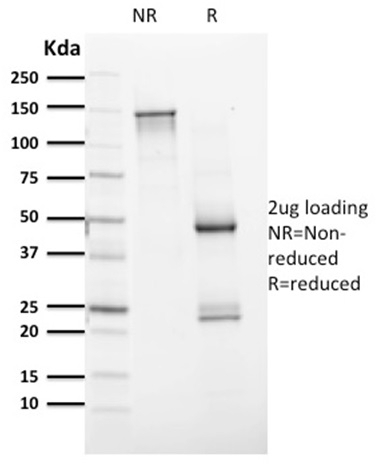 Purified PAX8 Mouse Monoclonal Antibody (PAX8/1491). Confirmation of Purity and Integrity of Antibody. Raji cells. 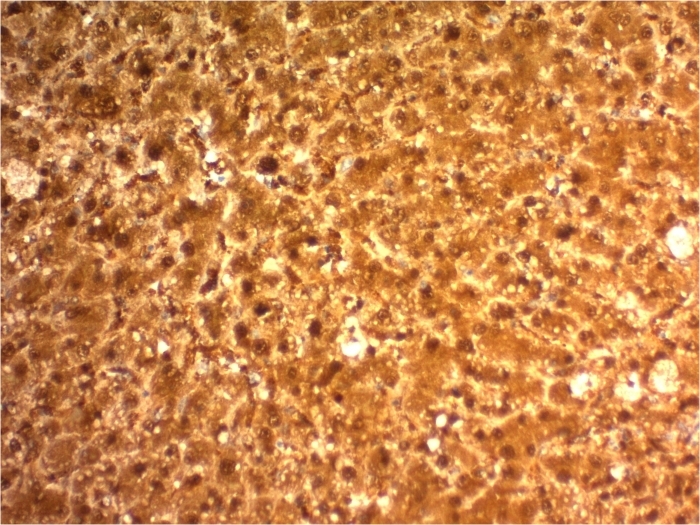 Renal Cell Carcinoma (RCC). Recognizes a protein of 62kDa, identified as PAX8. It is a member of the paired box (PAX) family of transcription factors. This nuclear protein is involved in thyroid follicular cell development and expression of thyroid-specific genes. Mutations in this gene have been associated with thyroid dysgenesis, thyroid follicular carcinomas, and atypical thyroid adenomas. PAX-8 is expressed in the thyroid (and associated carcinomas), non-ciliated mucosal cells of the fallopian tubes, and simple ovarian inclusion cysts, but not normal ovarian surface epithelial cells. PAX-8 is expressed in a high percentage of ovarian serous, endometrioid, and clear cell carcinomas, but only rarely in primary ovarian mucinous adenocarcinomas. PAX-8 expression is reported in renal tubules as well as renal cell carcinoma, nephroblastoma, and seminoma. 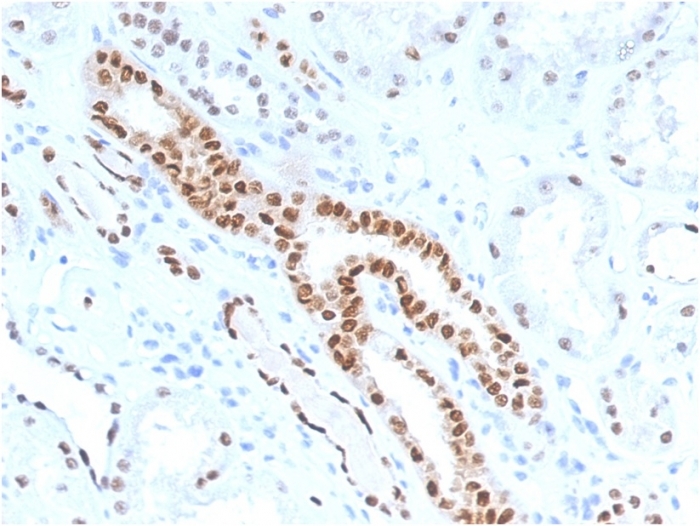 PAX-8 antibody may be used as an additional immunohistochemical marker for renal epithelial tumors. 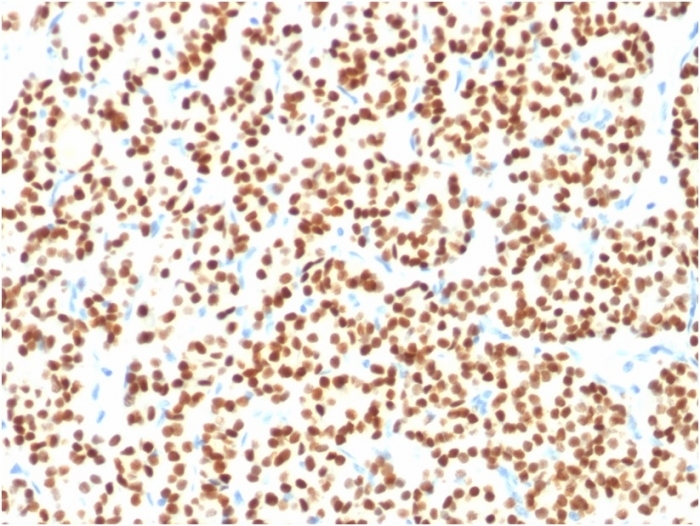 Tong GX,Yu WM,Beaubier NT,Weeden EM,Hamele-Bena D,Mansukhani MM,O'Toole KM.Expression of PAX8 in normal and neoplastic renal tissues: an immunohistochemical study.Mod Pathol.2009 Sep;22(9):1218-27.